Silk flowers are the nature touch on you; they are light color, light weight and seems to use with nature fresh. Popular used at home, bring the flower smell to your paper project also. 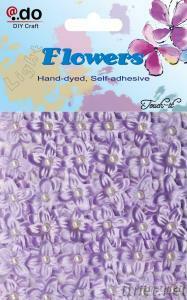 Each sheet has 36pcs flowers, 9 color available, like pink, light purple, golden, blue and etc.